By preparing and serving fresh, organic food in picturesque locations yards from where it was produced, Jim Denevan is bringing a whole new meaning to alfresco dining. Lucie Young bags a sought-after spot at his lengthy traveling table. Dining alfresco in the way the French and Italians do with extended family and friends sitting around a trestle table in the garden – at least in all those finely nuanced foreign films – is a dream for most Brits. The weather is rarely conducive and it is never as easy as it looks, juggling the to and fro of food. I caught up with Denevan at East End Community Organic farm (EECO) in East Hampton, Long Island, New York. Tonight’s 150-seat dinner has drawn guests from as far as Boston and Japan. ‘There is one woman who has been to 21 dinners,’ says Denevan, whose 6ft 4in frame and signature cowboy hat make him a dead ringer for the Marlboro Man. Denevan comes from a Californian family of innovators, adventurers and food-obsessed pioneers. His uncle Eddie Mirassou is part of the oldest winemaking family in the US. They first planted vineyards near San Jose in 1854 and just recently sold the operation to Gallo. Another uncle, Frank Dorsa, invented the Eggo Frozen waffle, which he later sold to Kellogg’s. And his eldest brother (he is one of nine children), Bill Denevan, was one of the first farmers in Northern California to go organic. After a brief stint as a male model, Denevan became a chef ‘to leave my days free for surfing’. His Alice Waters inspired, ingredient-driven food became a hit in Santa Cruz. But Denevan couldn’t stop thinking about his brother’s farm where he had worked as a child, ‘how hard the work was and how beautiful the setting’, and wondered how he could convey something of that to his diners. So in 1997 Denevan began inviting local foragers and farmers to his restaurant to tell diners the story of their food. Two years later, he took the idea a step further and staged alfresco farm dinners and a dinner on the beach, and Outstanding was born. There is never a rain date. If a storm breaks, the fall-back plan is usually a nearby barn or greenhouse, or a tent. But Denevan is a meteorology buff and he brags he can predict a storm down to the minute it will pass overhead. At a recent dinner, he set the table outside, despite knowing there would be 10-15 minutes of intense rain after everyone had arrived. ‘The wind blew over the glasses and some of the guests were hiding behind the bushes. The people who were not weather buffs were alarmed, but it cleared in a few minutes and then a double rainbow appeared’. The transition was so striking, and presumably the relief so great, that some of the guests started singing Amazing Grace. By 4pm, all the guests have arrived. But the chef Jason Weiner, who runs two of the most popular Hamptons restaurants, Almond and Almoncello, and who is on the verge of opening Almond in New York, is still trying to get one of the primitive gas stoves to light and calling out frantically for more serrated knives. 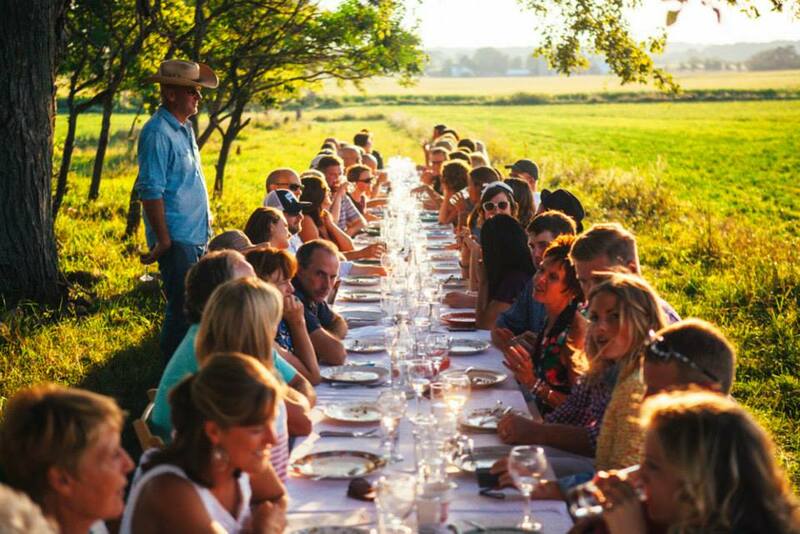 It is Outstanding’s procedure that before dinner the guests tour the farm. I tag along with Garnham and apiarist Mary Woltz, whose beehives are located at the heart of EECO. Her raw, unfiltered and unheated, Bees’ Needs honey is on the menu as part of tonight’s desert. In 15 minutes, I discover I have been living under a stone imagining that honey was one of nature’s last remaining uncontaminated, unprocessed products. According to Woltz, commercial bees are treated with the same disdain as feedlot cows, pumped full of antibiotics and fungals and fed monocultures that are neither nutritious nor healthy. ‘It’s like eating only lettuce or cucumber. It is not a balanced diet,’ she says. Worst of all, profit-hungry commercial apiaries remove all the honey from their hives (instead of taking only the surplus) and replace it with high-fructose corn syrup, which infiltrates the next season’s honey. At 6pm, dinner is served family style, with platters for eight dotted along the table. There is a momentary panic when it transpires that one guest in each group will have to fillet a fish using a serving spoon. When my dinner companion, Eugenia Bone (a cook and author of At Mesa’s Edge, a culinary adventure story about going back to nature in Colorado) steps in to do the task, there is a cheer from our section of the table. As dish follows charming dish, it transpires that the real stars of the evening are the people and the setting. Six hours have passed in what seems like a gilded moment. 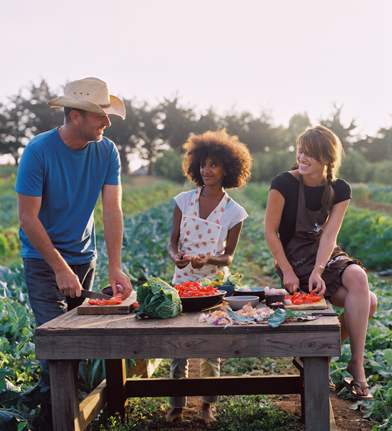 What could be more natural than eating nature’s bounty in nature? Then there is the rousing conversation between the super opinionated New York foodies and the passionate farmers who have contributed to the evening’s dinner. Perhaps this is what Alice Waters meant when she said about Outstanding, ‘It is the restaurant I always imagined’. Opposite me are David Falkowski and his wife, Ashley Tomkiel, of Open Minded Organics. Their shiitake mushrooms were part of one of the dishes, but one bite of the mushroom vinaigrette has Falkowski shaking his dreadlocks. ‘They used balsamic on the mushrooms! I’d never do that. It overtakes the taste’. Falkowski, like many of tonight’s farmers, is evangelical about his produce. ‘Never eat portobello’s or button mushrooms,’ he says. ‘They taste like dirt because they are grown on dirt.’ He is adamant about the superiority of his chanterelles and shiitakes, which get their complex flavour from being grown on rye, oat, wheat and straw. By 10.30pm it is almost impossible to see across the table. When the dessert arrives, it is a farmer’s idea of indulgence, a simple plate full of fresh peaches, drizzled with honey, yogurt and a handful of almonds. The flavours are so intense, it is instantly my favorite dish. When I finally track down Denevan, who hasn’t sat down all evening, he tips his hat with relief at another success. ‘I thought I would go cross-country for only a couple of years,’ he says. ‘But now I have been across America five times.’ This year alone he organized 37 Outstanding dinners (more than twice the number of the previous year). But Denevan is not hanging up his hat yet; there will always be another must-try location. In 2009, he is dreaming of staging events in England, Spain and Italy and of putting a table on Spiral Jetty, Robert Smithson’s 1,500ft-long rock sculpture on Great Salt Lake, Utah. Denevan is also a successful land artist himself and has been exhibited at MoMA’s cutting-edge art gallery PS1 in Queens. His giant geometric sand artworks (created with a stick or a rake on California’s vast beaches) are like his Outstanding dinners, an exercise in evanescence. They exist for only one brief moment and are all the more intensely felt for that.